Progressive's proposal for older Mainers may be unprecedented nationally and conflicts with the safety record of elderly drivers. In an unprecedented move, insurance provider Progressive Corp. is seeking state approval for rate changes that would allow the company to charge older Mainers higher auto insurance premiums based solely on their age. The proposal by the Ohio-based company would apply to new customers in Maine who had reached a certain age, according to documents filed with the state Department of Professional and Financial Regulation’s Bureau of Insurance. A hypothetical example that Progressive provided to the bureau shows a 65-year-old being charged 6 percent more than a 64-year-old based solely on the customer having reached age 65. Increasing rates for seniors based on their age alone would be a major departure from the way most insurance companies operate nationwide and in Maine, which has a population that leads the states in average age. Traditionally, healthy drivers with flawless driving records see their premiums decrease as they age. Progressive did not respond to requests to explain why it is seeking the rate increase for older auto insurance customers in Maine. Company spokesman Jeff Sibel said via email that “Progressive has sought the guidance from the Bureau of Insurance regarding the interpretation and application of state statutes,” but he did not offer any further explanation. Progressive initially asked the bureau to allow it to raise the rates of existing customers in Maine as they age, but the bureau denied that request in June, saying it would violate state law. Loretta Worters, vice president of communications for the Insurance Information Institute, a New York-based trade group, indicated that Progressive’s rate request in Maine appears to be without precedent. In its June 10 decision, the bureau left open the possibility that Progressive could request permission to charge new customers in Maine higher premiums based on their advancing age. After denying the rate filing and closing the case, the bureau agreed to reopen it this month for further discussion at Progressive’s request. The discussion would pertain only to the possibility of age-based ratings for new customers, the bureau said. Bureau representatives said state Superintendent of Insurance Eric Cioppa would not be allowed to comment on Progressive’s rate filing until the case is closed. About 14 percent of Maine drivers had policies through Progressive and its affiliates in 2014, according to the most recent Bureau of Insurance figures. One factor that could be driving the company’s request is Maine’s higher-than-average rate of fatal accidents involving drivers 65 and older. According to the National Highway Traffic Safety Administration, Maine led the nation in 2012 and 2013 with the highest share of older drivers involved in fatal accidents. 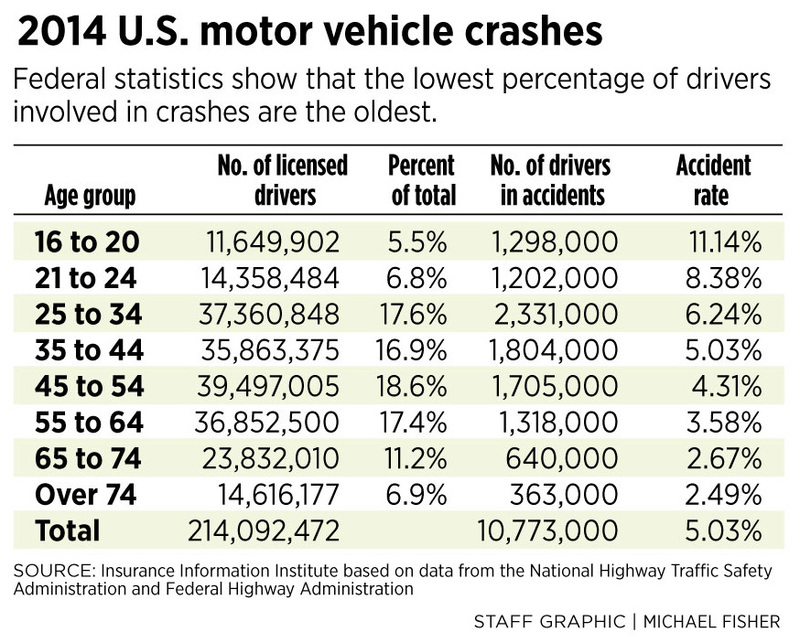 In 2012, the share of fatal accidents involving drivers 65 and older in the U.S. was 12.7 percent. In Maine it was 18.6 percent. In 2013, the share nationally was 13.3 percent, and in Maine it was 20.6 percent. Overall, Mainers paid $758 million in auto insurance premiums in 2014, according to the latest figures from the National Association of Insurance Commissioners. Bureau of Insurance spokesman Doug Dunbar said it was unclear what would happen next in the process of resolving Progressive’s rate case. “The next step(s) have not been determined, but it may well be that representatives from the bureau, the company and perhaps others would hold a conference to take up the reopened portion of the original decision,” Dunbar said via email. The Portland Press Herald surveyed a handful of Maine insurance agents, who said they had not heard anything about Progressive’s efforts to raise rates for older drivers. Worters, of the insurance institute, noted that drivers’ abilities do tend to deteriorate as they age. Older drivers – typically those over 70 – have higher rates of fatal crashes, based on miles driven, than any other group except very young drivers, Worters said. A reduction in peripheral vision, slower reflexes, medications and other factors can contribute to impairment of driving skills, Worters said. For that reason, elderly drivers should expect to see their rates begin to rise. AARP Maine State Director Lori Parham said that although her organization has not engaged directly with Progressive on the pending rate case, AARP opposes any action that could limit the mobility of healthy seniors in Maine. 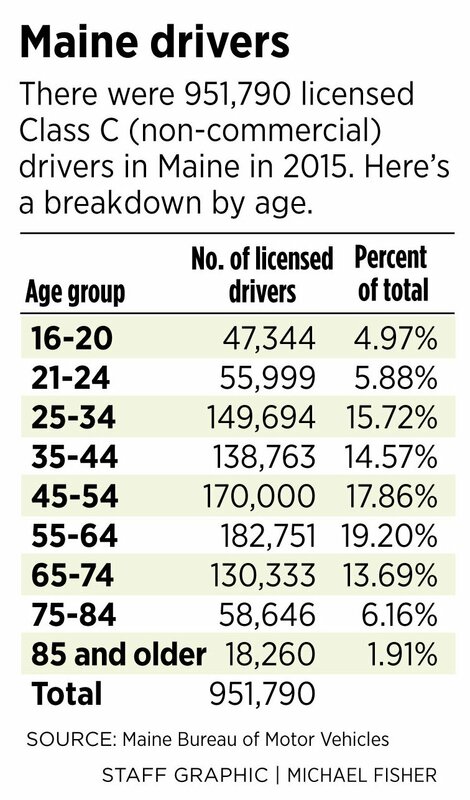 Maine has some of the strictest testing requirements in the nation for older drivers to renew their licenses, according to the Insurance Information Institute. All drivers must take a vision test at their first license renewal after turning 40, at every second renewal between the ages of 40 and 62, and at every renewal after turning 62. The renewal period shortens from six years to four years for drivers over 65. Parham said allowing insurers to raise premiums for seniors based on their age alone would have unintended consequences in Maine. “If the state of Maine moves in the direction of limiting access to the road for older drivers, it will also have to begin to address the lack of transportation alternatives for older Mainers in the oldest and most rural state, by many indicators,” she said.